The Wüsthof CLASSIC IKON Santoku Chefs Knife puts a modern spin on the classic Santoku style knife. It’s moderately priced, well made, and offers an alternative feel to the traditional chef knife. The design of this blade is ideal for making very thin, effortless cuts. Formed from a single piece of high-carbon German steel, this blade is forged with laser precision and is tempered for a long-lasting sharpness. The kullened edge creates less friction when cutting and allows food to easily fall from the blade while cutting. The triple-riveted black handle is contoured for a comfortable grip while still maintaining sufficient balance. The full tang extending through the handle creates enough heft while maintaining that balance. Wusthof is still a family owned company that focuses on craftsmanship and quality. Classic ingredients and time-tested methods are used to forge their blades. Dating back to 1814, Wusthof has created quality chef knives for professionals and home cooks. The blade is made of high-quality German steel, and Wusthof’s tempering process creates a blade that will maintain it’s edge, requiring minimal maintenance. 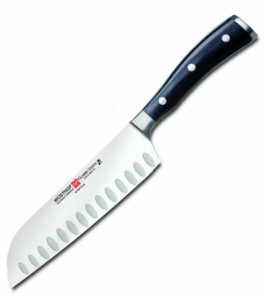 The Wüsthof CLASSIC IKON Santoku Chefs Knife also has a unique partial forward bolster, designed to allow sharpening of the entire blade. The back bolster adds enough weight, combined with the full tang, for acceptable balance. The laser-tested cutting edge is designed for very thin slicing. It’s smaller size allows for the finesse needed for precise cuts. This style of blade is unmatched for these purposes. Just how good is the Wüsthof CLASSIC IKON Santoku at chopping? Does it really keep the food off the blade? Take a look at this great video from Surla Table and find out. The blade is smaller than an average chef knife, measuring 7 inches. Intensive cutting and chopping can be more labor intensive using a blade of this size compared to a bigger blade. The Classic Ikon chef knife will also require sharpening out of the box. At it’s best, it’s less sharp than the higher end chef knives. While the handle is comfortable and balanced, it’s not the best for grip. Combined with a dull blade, this can create a safety hazard, making it more important to keep your blade sharpened. The Wüsthof CLASSIC IKON Santoku Chefs Knife is a unique blade that’s more than serviceable for a chef of any experience level. The high-carbon German steel, being stamped and tempered, should last many years with proper care. The full tang handle is triple-riveted for heft and balance. These features combine for a sturdy yet flexible blade. Wüsthof CLASSIC IKON Santoku Chefs Knife is a great alternative if you’re looking for a non-traditional option. This blade isn’t necessary a jack-of-all-trades, but it’s great for slicing, dicing, and chopping. It’s one of the least expensive best chef knives listed, and the price is fair.